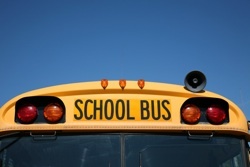 Passing a School Bus | Cook County, Illinois Unlawful Passing of School Bus Lawyer The Davis Law Group, P.C. Contact Lake County Traffic Crime Defense Lawyer The Davis Law Group, P.C. In Illinois, the law for Approaching, Overtaking, and Passing a School Bus is included in the Illinois Vehicle Code under 625 ILCS 5/11-1414. The law requires a driver to stop before meeting or overtaking (from either direction) a school bus stopped for the purpose of loading or unloading students. The law applies to any and all locations including, but not limited to, highways, roadways, private roadways, parking lots, and school property. A full stop is required if the school bus is displaying the visual signals specified in the code (i.e. flashing lights, stop signal arm extended, etc.) and the driver should not proceed until the visuals signals cease, the school bus resumes motion, or the school bus driver signals the vehicle to proceed. The law does not require a driver to stop on a four-lane highway when traveling on the opposite two lanes from the school bus. Passing a School Bus while Loading/Unloading can lead to a driver's license suspension. The Illinois Secretary of State will automatically suspend the driver’s license of anyone convicted of violating this law for a period of three months. In addition, the court will impose a minimum $150 fine for a first offense plus mandatory court costs. A second or subsequent conviction for this offense within five years of the first conviction will result in a one-year driver’s license suspension and a minimum mandatory $500 fine. Our defense attorneys are able to evaluate your specific case and determine the most effective strategy. Avoiding a conviction and preventing a license suspension is our top priority. The attorneys at The Davis Law Group, P.C. frequently represent clients charged with unlawfully passing a school bus and a wide variety of other traffic-related offenses throughout the Chicagoland area including Cook County, Lake County, and DuPage County. Contact our defense attorneys today to discuss your case.